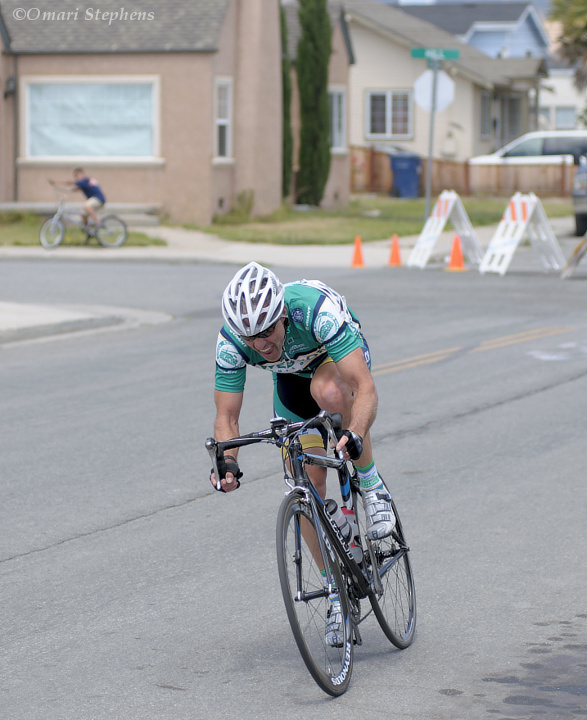 A few weeks back, I went down to Watsonville to watch my friend Nils race in a criterium there. When I arrived, the 35/45 Master's race was at around the half-way point. The young guy in the background was racing the peloton as it flew past, and the race itself was a battle of breakaways, attacks, and counterattacks. 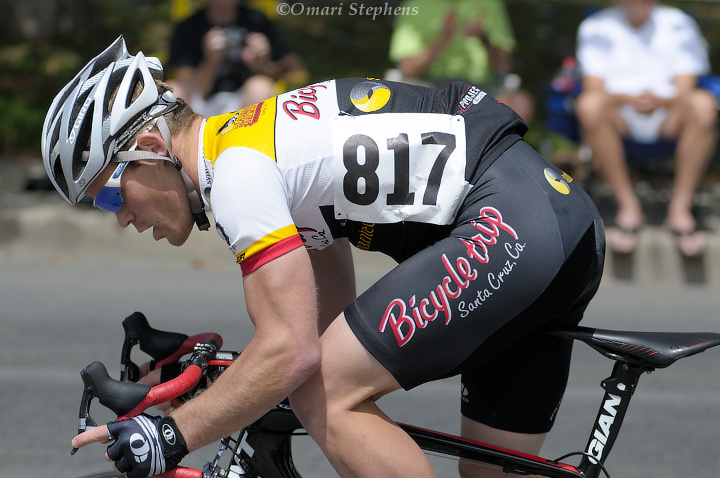 On one seemingly-brutal lap about 10 minutes before the finish, William Dunham (above) screamed silently as he strained to stay on the tail end of the peloton. He finished 10th in the 45+ age group. This is Nils. He was in leading breakaways for 31 of the 34 laps in the race. For the first 10-or-so laps, he was on a solo break, when he had a crash with a lapped rider and flatted. After his free lap, he joined Josh LaGrange, who had launched off the front and the two built and held onto a sizable lead until around 10 laps to go. From around 10-to-go, it was clear that the peloton were making headway and closing the gap to the two leaders. 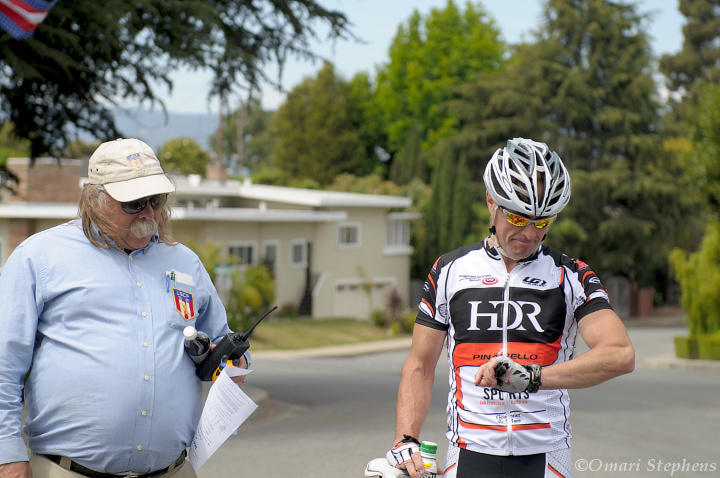 Here, Keith DeFebre, who placed 6th in the Masters 35+ race, takes a break from chatting with a USCF official in order to check the time gap from the lead break to the peloton. With a few laps to go, David Benkoski soloed to bridge the gap to the leaders. And with two laps to go, the peloton finally closed the gap to the lead group to set the field for a group sprint to the finish line. 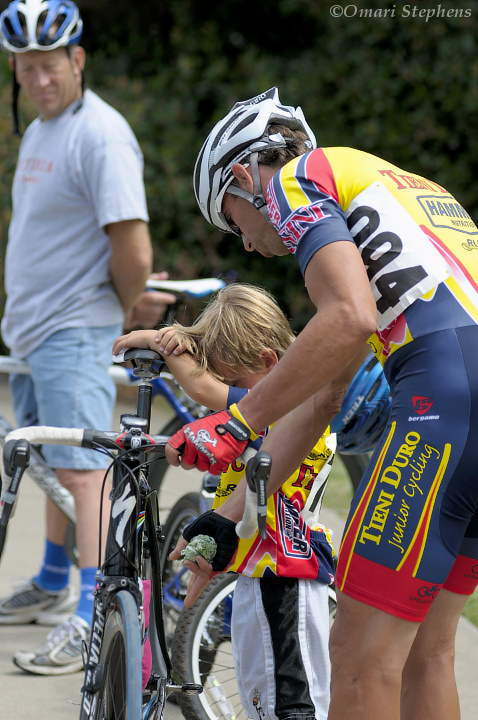 While watching from the sidelines near the finish line, Masters racer Mike Gadow teaches a young rider about the cheap (non-drive-side) and expensive sides of a bicycle — on a race bike, the rear derailleur alone can cost upwards of $300. "If you have a crash, try to go down on this side." At the line, Benkoski sprinted clear of the field for the victory. Nils crossed the line in fifth place and LaGrange placed seventh.